Eating food off a stick raises the fun factor by a multiple of ten, at the very least. Even more so if the food is traditionally eaten sans stick. Salad is no exception. Some childlike enthusiasm inevitably bubbles to the surface, provoking “ooohs” and “ahhhhhs” and small smiles. 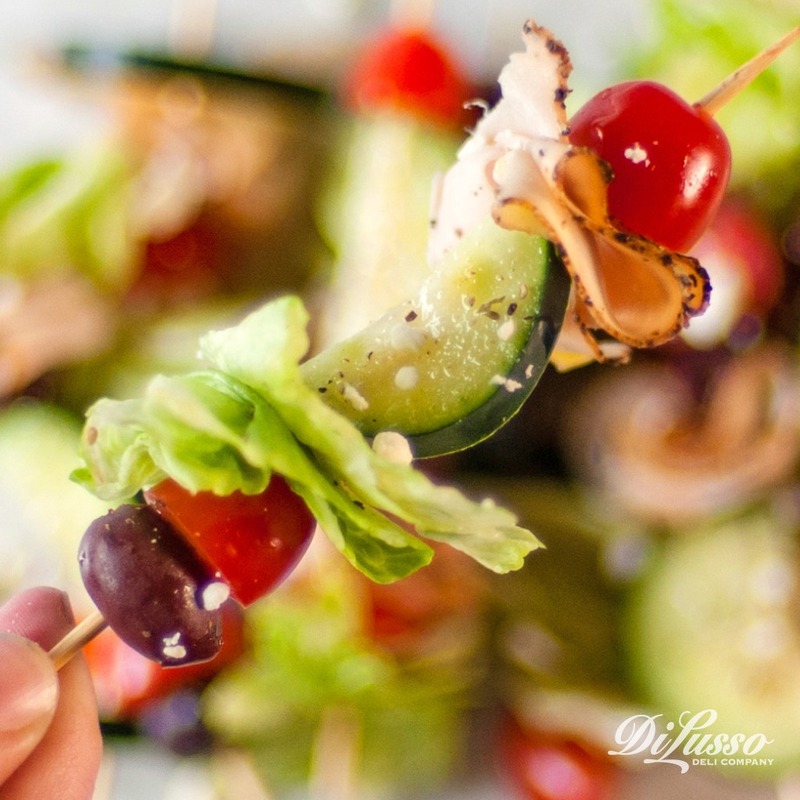 Salads on a stick also have some practical advantages. They’re portable, making it easier to mix and mingle with salad in hand at get togethers. They’re also less messy to serve. No more watching dressing-laden lettuce fall limply to the table or ground thanks to clumsy serving utensils. 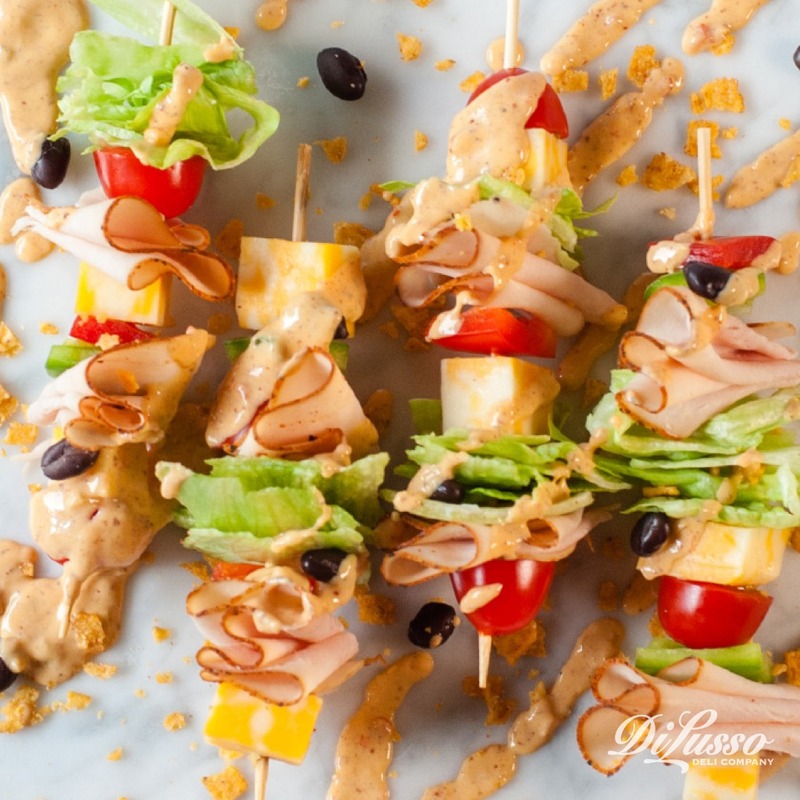 So whether you’re laying out rows of these at a patio party, graduation celebration or something in between, here are a few salad-on-a-stick assembly tips and recipes. 1. Prep all of your ingredients (wash and cut produce, mix dressings, etc.) before you begin assembling. 2. Use toothpicks or skewers that are about 4-5 inches long and made from plastic, wood or bamboo. 3. For a touch of fancy flair, try using decorative toothpicks or skewers in festive shapes and colors. 4. Stack ingredients according to size, starting with larger ones. 5. 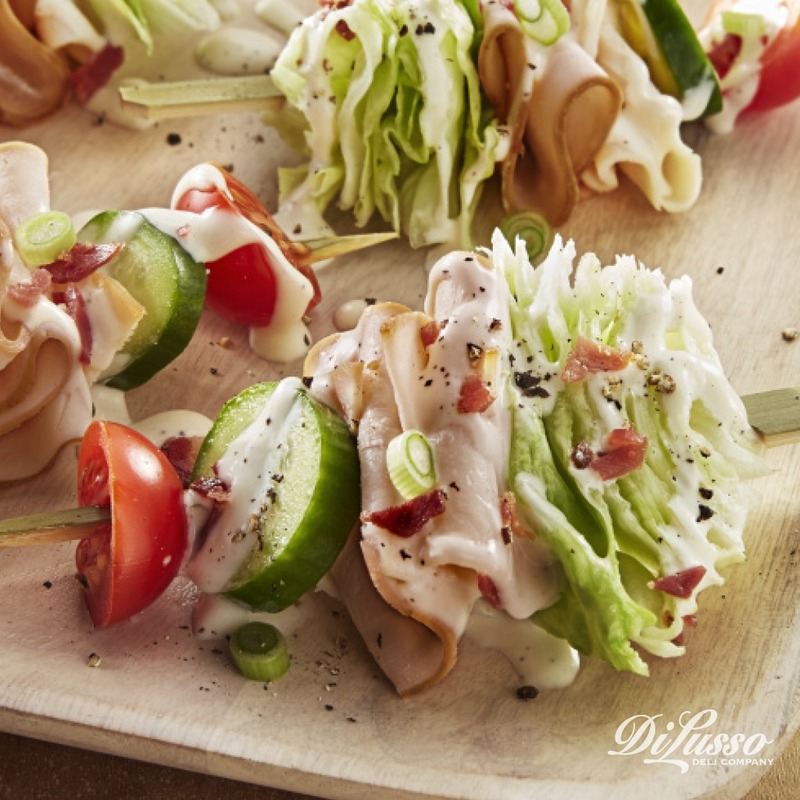 Drizzle with dressing and sprinkle with toppings after you’ve made an entire platter of skewers. 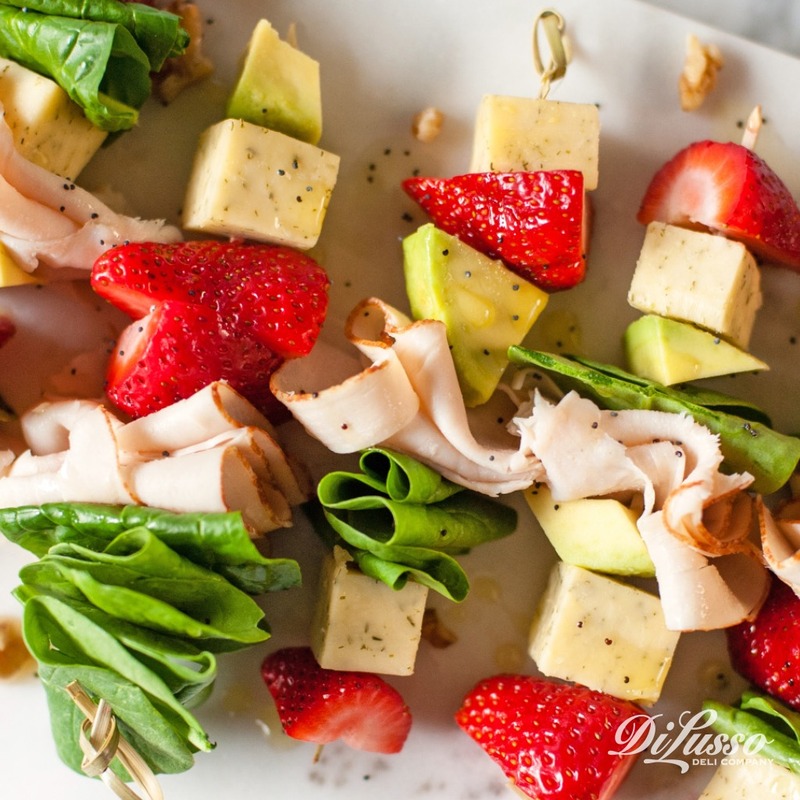 Drizzled with a sweet poppy seed dressing, these skewers embrace one of the best parts of spring and summer: fresh fruit. Our golden brown turkey breast, Havarti herb cheese and fresh avocado add a savory touch while chopped walnuts give it a satisfying crunch. We remixed the traditional wedge salad by adding a few slices of our applewood smoked chicken, fresh cucumber rounds and green onions. A delightful combination of smoky and sweet, crisp and creamy. 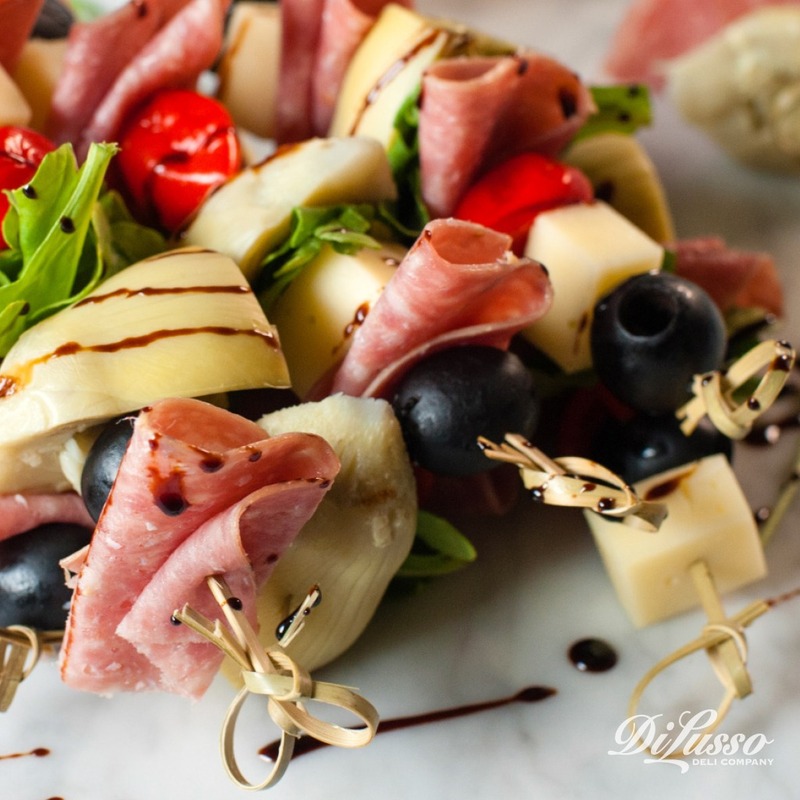 To give these skewers that distinct Mediterranean flavor, we used herbs like oregano and parsley to create a tangy yet savory red wine vinaigrette. Our cracked black pepper turkey breast gives these skewers a piquant edge. Creamy feta crumbles bring it to an elegant finish. If you’re looking for something with a little kick, look no further. A velvety chipotle lime dressing (featuring our zesty chipotle mustard) and our cajun style turkey breast bring the heat while fresh veggies, black beans and our colby jack help temper the spice. Crispy tortilla strips finish it off with a poppy crunch. As the name suggests, we loaded this one up with Italian favorites like peppery arugula, artichoke hearts, and our Genoa salami and provolone. Peppadews and a rich balsamic glaze add a sweet element. Delizioso!